At first glance, this might be all there is to Space Invaders Extreme, and indeed you can happily play the game just blasting away at aliens. However, take the time to learn how to make chains and a whole new game opens up. 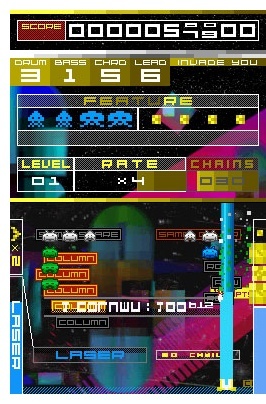 There are several ways to make chains on each wave, usually it involves shooting four invaders of one colour, followed by four of another colour. When you do this, a flashing UFO will fly across the top of the screen. Shoot that down and you'll activate a challenge level. Here you must destroy a set number of invaders, UFO's or waves, or perhaps survive for a set amount of time. If you achieve this, you then activate fever mode, during this time everything is worth more points, especially the Jackpot UFO. If this all sounds complicated, it really isn't, not once you've done it a couple of times. Once you settle into a rhythm, the challenge of getting those high scores, while staying alive in order to get even more high scores, quickly becomes compelling. Later levels will challenge even shoot-em-up veterans. For those dedicated to the art of high scores, there's even on-line play and on-line leader boards to access via the Nintendo Wi-fi connection. Personally I was disappointed there was no "classic" mode, that closely emulated the original arcade game, but I suppose that's only really of interest to old timers like myself. Re-making old videogames is not always an easy task. On the one hand, those who remember the original want the game to stay faithful to its roots. On the other hand, younger gamers won't be impressed with 30 year old visuals and game play. Space Invaders Extreme manages to keep faithful to the source material, but in a way that reinvents the classic game-play into something much more modern and compelling. It's a resounding success and one that suits quick burst handheld play really well. If you like shoot em up games, then you'd be crazy not to make space for this game card to invade your DS!